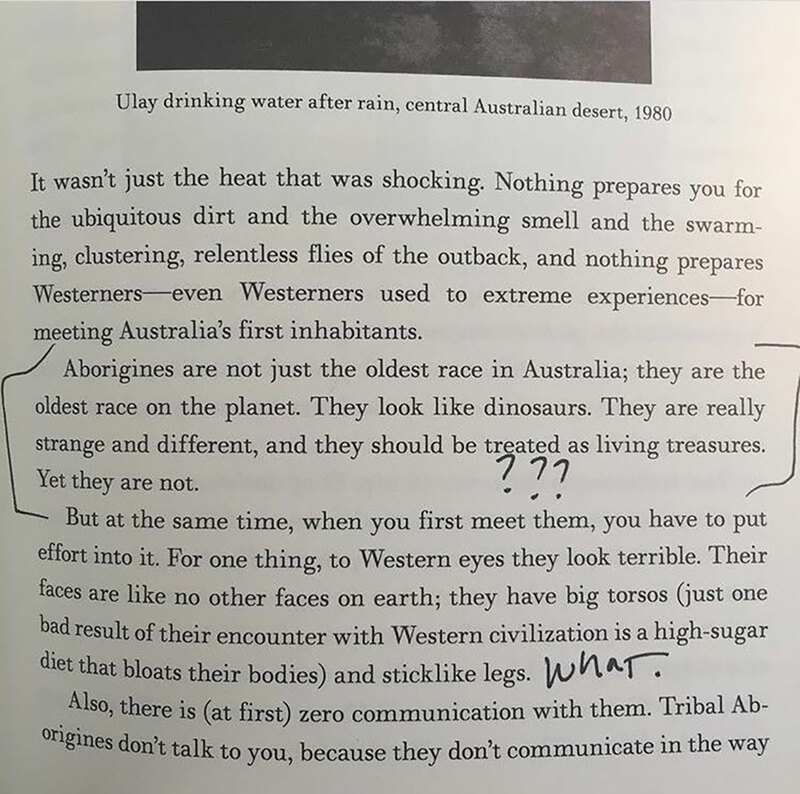 Slavic performance artist Marina Abramović has come under fire overnight after a leaked passage allegedly taken from her forthcoming memoir, Walk Through Walls, appears to describe Aboriginal Australians as “terrible” and “like dinosaurs” in their appearance. “Aborigines are not just the oldest race in Australia; they are the oldest race on the planet,” writes Abramović, who has come to prominence as the world’s most famous performance artist in the years since her 2010 MoMA retrospective and an accompanying documentary both called The Artist is Present and named for a 90-day sit-in performance in which the artist sat motionless opposite gallery patrons and stared unmoving into their eyes. “They look like dinosaurs. They are really strange and different, and they should be treated as living treasures. Yet they are not,” she continues. Abramović has since issued a statement on the matter, attributing the passage to a diary entry made on her initial encounter with Aboriginal people in Australia during the late 1970s and early 80s, when Abramović and her then-partner, the German performance artist Ulay, lived for the better part of a year with the indigenous people of Western Australia’s Little Sandy Desert. That experience informed her next work, Nightsea Crossing, in which Abramović and Ulay sat opposite and stared at each other silently at Sydney’s Art Gallery of NSW, where it premiered in 1980. The story today, however, is one that calls out Abramović for her blatant racism, condescension and pseudo-scientific posturing toward Australia’s first peoples. In the interim period between the passage coming to light and Abramović issuing a statement, #theracististrending had already begun to trend on Twitter. Regardless of how Abramović may have felt in the pages of her diary in 1979, there’s no discernible need for those comments to appear in a memoir slated for release in 2016. You can read the artist’s statement below.